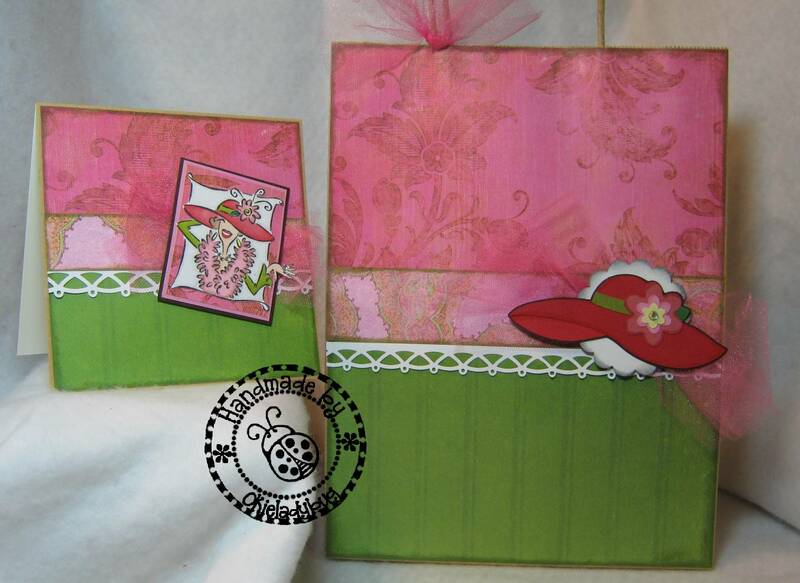 Okieladybug's Scrap N' More: Blog Hopping with Going Buggy and the gang! PRIZES!! Blog Hopping with Going Buggy and the gang! PRIZES!! If you have arrived here from Enfys at GOING BUGGY, you are in the right place! And even if you didn't then go and start at GOING BUGGY and come back here to hop along with us! Make sure you go through to the end of this post for more instructions on how to enter for my giveaway and continue with the blog hop. Welcome to my first blog hop participation, and yes I am nervous! *okie holds up finger nails she has chewed as proof of her nervousness* Make sure to check out the whole post because at the end there are instructions on what you need to do to continue along the hop. 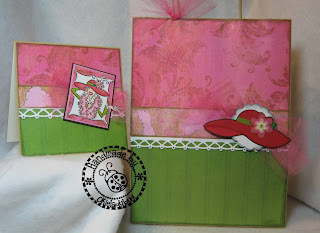 My project for the blog hop is a card and matching gift bag. I didn't stamp any sentiments on the card and bag because I thought this way it could be used for birthday or general use. The gift bag is one from Walmart that comes in a pack of 10. I only decorated the front since it is only the front that really matters. I used some pink tulle to add a little extra embellishment on the bag handle and then behind the hat. The image for the card is a Stampin Up! set that I got at a stamp sale a few years back. I love this set because it is just so fun looking. I added 2mm heat set rhinestones for the necklace and a 3mm for the ring. I used Forever Young for the cut for the hat. I thought it matched the one on the card nicely and tried to use colors as close as I could find that matched the colored stamped image on the card. I did have to use the hide contour feature in Design Studio so I could cut the band and the yellow center. The green leaf is hand cut because otherwise it would have been red like the hat base. I shaded around the edges of the hat with the Lipstick Red ProMarker and then Baby Pink on the flower. I used a 5mm heat set rhinestone to add to the middle of the flower. The scallop circle is a 2 3/8" Stampin Up punch. 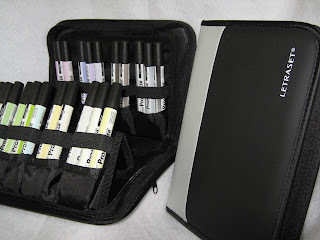 For my giveaway today I have a set of 12 ProMarkers and 1 ProMarker Wallet. Now don't get excited you are NOT getting the markers in the wallet, those are mine. But at least you will have 12 to get you started if you win! *okie waits to hear the ooo's and ahhh's* So make sure you follow the directions in order to win! Deadline to enter for my prize is Saturday, January 22nd at 6 pm. Now all you have to do to continue the hop is click on the follow button and leave a comment under this post, it may take awhile for your comment to appear so please comment just once. Now you can hop on to the blog of PAPERCRAFT INSPIRATIONS MAGAZINE to pick up your next letter. Now that is a fab card and gift bag! And I love my Promarker wallets too - the crafting filofax!! I love your projects Okie!! Such a beautiful set. I love the colors!! Congratulations on the first of many Blog hops for you!! Wow! You've got a great blog... lots of inspiration, thanks!! Your project is gorgeous! I'm just hopping around for Enfys...so much fun! Great projects, love all the detail and coloring. I would love to win the promarkers. hippity hop...joining the buggy fun hop. Your project is amazing and what a really generous gift!! !I really enjoy blog hops because i can share lots of new inspiration i would have missed out on. I LOVE your card and bag. After seeing that really cute hat from Forever Young, I may need to go buy it even though I didn't think I needed it. I also think I'm going to have to invest in some promarkers finally (not until next month, after I pay my car insurance though). Hiya am now a google follower thanks for sharing your fab gift bag and card and the chance to win yummy promarkers too. 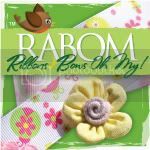 This is a fun blog hop!! Love your project, it's gorgeous. WoW, I am the first to comment? Gorgeous card and bag! I have never tried ProMarkers but I'm ready to try! Finger crossed and prayers said! OOH, AAH this is one fabulous hop! What a sweet papercrafting project you created!On with the Hop and thanks for the chance for some treats. Okie...I am ooo and ahhing over this! I dont have Promarkers yet and I want some!!! As always, your card and bag are so stunning! I love how you found a Cricut cut to match your stamp. Wonderful set! Hey, I get to be the first comment. Oh, the pressure here. So, luv me so pro markers, yes? I'll follow you anywhere..
Great card. I agree would be great for a birthday or could be used for several general purposes. I just love your cards. I am already a follower. Would love to win. Love your project. I just love your card and bag! The lady reminds me of Mrs. Howell from Gilligan's Island...did you ever see that show? I love the tule. Nice touch! Okie, I love your card, thanks for the chance to win the PROMARKERS. I follow your blog and love all your creations, you keep me smiling all the time. Love your card! I haven't tried Promarkers yet so I hope I win!! Love this card. Any girlfriend would love it. Very nice I LOVE the hat! I love the bag and card. They are very cute. I am going to have to get that cart. Thanks for the chance to win the Promarkers. Okie, I love this set, and you are as funny as always (only need to decorate the front of the bags!! :) I love it!!!) I haven't tried Promarkers yet, but am looking forward to trying them soon. Okie congrats on your first blog hop participation. Can't believe this is your first hop as you are so creative (no need to be nervous). Love the card and bag, good for any occasion, thank you for sharing and hope I can win, want to try these markers soooo bad. I love your card and matching gift bag! Thanks for the chance to enter. I love the card and matching bag. I don't know why you would be nervous, as always your project is fantastic. Thanks for the opportunity to win. Never done a blog before it just sounded interesting and something new. Thanks for offering this prize. i love promarkers. Hi okie! Love the red hat card and Bag! You did an awesome job! TFS!!! What a great card and bag combo. Love how you were able to match the hat on the bag to the stamp. this blog hop is awesome - I have found some new blogs I had not yet seen. As a newbie this is a great way to get started. I am so surprised that this is your first hop.I love that SU stamp. It is fun get the out our deals that make us happy. OK I am off to hop. Wish me luck I would love to win your prize. Well any prize would make me happy. Oh I posted a gypsy tip on my blog. I would love to have you take a look. Your card and bag are adorable! Thanks for the chance to win such an awesome prize! What a cute gift set. This would be perfect for my sister who I tease that will be joining the red hat club soon:) Thanks for the chance to win some of these markers. I have been wanting to try them. Cute card and bag! Thanks for this blog hop and chance for the prize. Great blog - I love my promarkers so much! Will definitely be back to study your blog more. Thanks for the chance to win your goodies, your projects made me think of the Red Hatters they are great! Love your project. This is just fantastic. Amazing card as usual and love th bag! Your project is fabulous. That hat cut is so much like the stamp. Great idea. Love seeing what you have done!!! Wow!!! And LOVE the markers!!! ooooo and aaaaahhh!!! Okie, your projects are awesome as always! I've got that cart...love the hat! Congrats on your first blog hop! Thanks for the chance to win the markers too! That matching bag & card is SSOOO CUTE!!! I love it!! Great giveaway I have been wanting to try these markers, well I have to keep hopping I am very curious to unscramble the word!! Thanks for all the inspiration and laughs! Congratulations on your first blog hop!! You dun good girlfriend!! I cannot believe this is the first blog hop you've participated in! The card and bag look great Okie! Great card! Hope your fingernails recover:) I have not seen Pro-markers yet. I use 'Marvy Le Plume', something I can easily find here in smalltown Canada:) WOuld love to win these fab looking pens and try my stab at colouring more professionally. Thanks. I love the idea of making a gift bag to match the card. I think I will make a few of these this afternoon. Thanks for sharing! and the chance to win some markers! Loving the gift set and loving your giveaway!!!! I want to see the rest of the stamps in this set. Great Red Hat ladies! Cute card and bag set!!! I'd say for your first blog hop, you done good, girl!! Absolutely adorable! 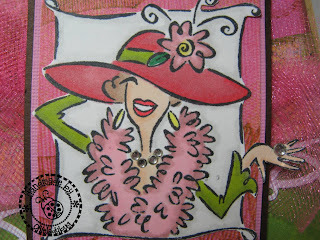 That hat is the perfect match for your stamped image ... way to go! Congrats on your first blog hop ... you did good!! Love it and I left a comment purely because I love it. I didn't even know you were doing a blog hop. Beautiful. Love the card and the bag! I love your blog Okie, it's one of the first places I go each day. I would love to have some promarkers so....pick me! Love your card and bag.... Very Pretty! TFS your work with us! Love your card - it is beautiful! I love the colors! And what a great giveaway! Thank you for the chance to win! Okie I love your card and bag... soo stinkin cute! I love this Blog Hop ~ I am a follower!! Very cute card & bag...love the stamp!! Great card and bag set! I did the appropriate ohhing and ahhhing when I saw your wonderful prize. Thanks for the chance to win! Wow! What a great project. The bag looks great! And the card is just darling! I'm already a follower, so on the the next stop! Thanks, Okie! GREAT job with coordinating the card and the hat. Love how you got everything to match up. And I'm sooooo impressed with your coloring. Congratulations on your first blog hop too! I'm already a follower so I didn't click. I love your blog and all of your projects. Thanks for the inspiration! A love blog hops, off to the next blog. I am definitely ooohing and aahhhing over your giveaway! Oakie, Love, love all of your projects and today's gift bag and card are fantastic. I'm with you about "Garnering" great choice of words :) Thanks for such a great giveaway. What a gorgeous card and matching gift bag. Love that hat! love it! Great job Okie! Love the card and bag so cute!!! I so love that stamp... she reminds me of Mrs. Howell on Gilligan's Island!! Fun bag and card! TFS! Beautiful cards and love the colors. Boing boing, im hopping here there and everywhere. I'd love a chance to win the markers! Okie, this card and bag are sooo you. So So darling. Woo Hoo....my first blog hop! Great giveaway...I'd LOVE to win! Hey Okie, you are doing a great job, are you SURE this is your first hop? Fab project, I have that stamp set, must dig it out. Thanks for joining in with the hop, now I wonder who the winners will be on Sunday???? Love these cards! Loving this hop! Love your card and gift bag they're fabulous. No reason to be nervous your'e blog and work are wonderful. TFS and the chance to win. 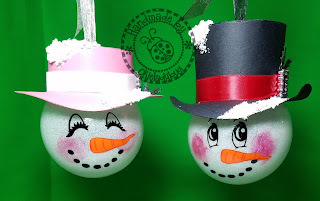 Adorable projects and what a great giveaway! Fantastic card & matching gift bag! Absolutely love both ... and love the red hat! And your gift ... absolutely fantastic too! Thank and I will be back to visit again! I am so excited, this is my first blog hop I am learning so much. I love the way you matched the stamp set to the hat on Forever Young - am going to have to start checking out how many stamps I have that can be used with my carts... thanks for sharing! I love your card Okie. Thanks for the chance to win the pro markers. I would love them. I love your project, love love your blog and would the promarkers. Love that stamp and the FY hat to match is maavelous. Love your choice of colours. I love your first blog hop! Just think if I win you can save on shipping! :) I don't have any of those markers nor can you believe copics! Amazing! I love how it matches so well! Perhaps you can teach me on the cruise how to do flesh tone and bring the stamp images to life. What year was that stamp set made or the name of it? I have to check my stash. TFS! Bloh hops are the best invention since sliced bread! I love going to new sites to see beautiful projects. Those markers are soooooo inviting! Thank you. Love this blog...look forward to it everyday! Thanks for the chance to get some promarkers. I've been hoping to get myself some. This is my first blog hop. I love your project. The stamp set is just adorable. I haven't worked with any markers and stamping before but would like to try it out. What a cute set. 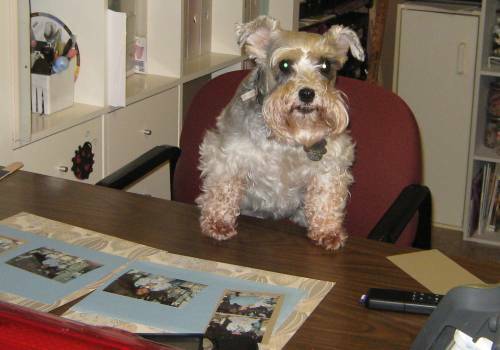 I love reading your blog because you are a hoot! These are stunning! The Red Hat Society would love these! If this is what Promarkers can do, I would love to have some or win some! Thanks for your inspiration! That is an awesome bag and card. I love hte colors. Okie that is such a CUTE set! you never seem to amaze me. Very cute, Okie! I like how you left them for general use. OOH & AHHH...would love to win those markers and I became a follower. I love the card and bag. Those are my 2 favorite colors. Too long since I've been to your blog; how am I ever going to catch up! Card and bag are ladybuggley cute! I garner too. That's what I'll tell my hubby. What an adorable best friend. Thanks for the chance to win. This is my first visit but not my last. I love your projects and your card and gift bag are awesome. Thanks too for a chance to win some pro markers. Ooooo and aaahs for sure from here. Hopping off to get more letters. I'm already a follower, thanks for the chance to win! Great set. I love the stamp and the hat cut. They really compliment each other. Would love to win themarkers. Really cute card and bag! You did a great job coloring the image. And what a great prize! Would love to win those markers. I am going to win me some promarkers or die trying!!! Love they lady you used for this project, very cute! Love, love your bag and card. Great job as usual. Typos in previous comment when I re read it, sorry. Hope you don't mind, but I've deleted it and am submitting again. I love your gorgeous card and gift bag... such fun, and so bright and cheery. I'm a follower of your blog. Thanks for such a generous and amazing giveaway... happy dance material, indeed. I've seen so many stunning cards coloured with Promarkers... inspirating. Love the idea of the case that doubles as a stand too. You are a lucky girl to find that stamp at a garage sale. Love it. Thanks for sharing and for a chance to win. As always a great card and bag. Okie! Love your blog - such inspiration. thanks for the chance to win, Promarkers no less! My dream! Okie, your projects are always fabulous! And your blog is such a treat to read! Love the card and gift bag, beautiful job!! What a great giveaway!! I just love your card and matching gift bag! 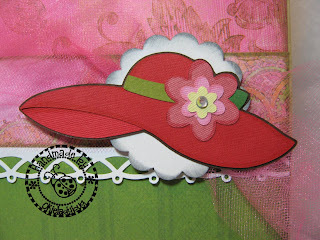 Your hat matched the stamped image so perfectly! I couldn't believe it was a die cut at first! Ooohhhh! Aaahhhh! I just started my Promarker collection for Christmas, and I don't have those great and basic colors in the set, so I would love that! And, I am desperate for a good storage solution for my Promarkers, so that wallet would be perfect! I am already a long time follower! Thank you so much for the chance! Great card and bag as usual. Thanks for the chance. OOO what great prizes! Thanks for your lovely gifts. But even better, I love your card and bag. I didn't know you could buy them in packs! Yes I know...such a sheltered life! lol Thanks again, and you did a great job,so no more nail biting! Beautiful job on your card and gift bag:) Love them! Love your card and gift bag! You are such an inspiration. Great giveaway! Promarkers are on my wish list! ooh! ahh! great projects. great blog hop. tfs. I absolutely love your card. I am new to the crafting world and am amazed by all the beautiful and creative people I have visited. Thanks for sharing! Wow! Love your blog and have now subscribed to your posts so I don's miss anything. I'm always in need of inspiration and this looks like the place to find it. Thanks for all the great ideas. Congrats on your first blog hop! Thanks for a chance to win the pro markers. I love your projects!! This blog hop will be fun. Nice card and bag, thanks for sharing. Okie, you are a hoot. Love the card. I look forward to your post, thanks for keeping things lite. You make me laugh and I love your work. I love the cards you make! Please don't ever stop. I'd love to try those markers, Okie. Love the card and gift bag combo! Great batch of prizes being offered, you girls are wonderful! Love the red hat!! Nice work on great projects. Thanks for the opportunity! Love your card and gift bag! Thanks for the chance to win a terrific prize! I so love the card. I would love to win these markers. they sound so cool. thanks for a chance. The cricut cut matches that stamp so perfectly! I love when there are cuts like that. Such a pretty set! Okieladybug...you're the bomb! And I mean it!! I've added you to my Google Reader, and now I never miss a post!! Keep up the great work and humor...love it! Great project! You did great on your first hop. Thanks for sharing. Ohhhh....Ahhhh great giveaway! Love the card and gift bag. The colors are perfect! You have a wonderful blog Okie...you always make me laugh before leaving. Thank you for the fun and opportunity for a chance to win. Can't find those markers anywhere in the Philippines! Yummy!!! I love the color coordination on your project. What lovely pieces! Please enter me on your giveaway. Thanks. Your card and gift bag are so cute! I've never used ProMarkers before, but your projects look wonderful with them. I'd love to try those Pro Markers! Love your blog...you're the best! Love this card and bag - love all of your projects. Great blog hop! Thanks for the chance to win! Great card and gift box, lovely colours used. Thanks for the chance to win here on the hop. What a wonderful card and bag, too cute for words. TFS. You did great on your first Blog Hop. 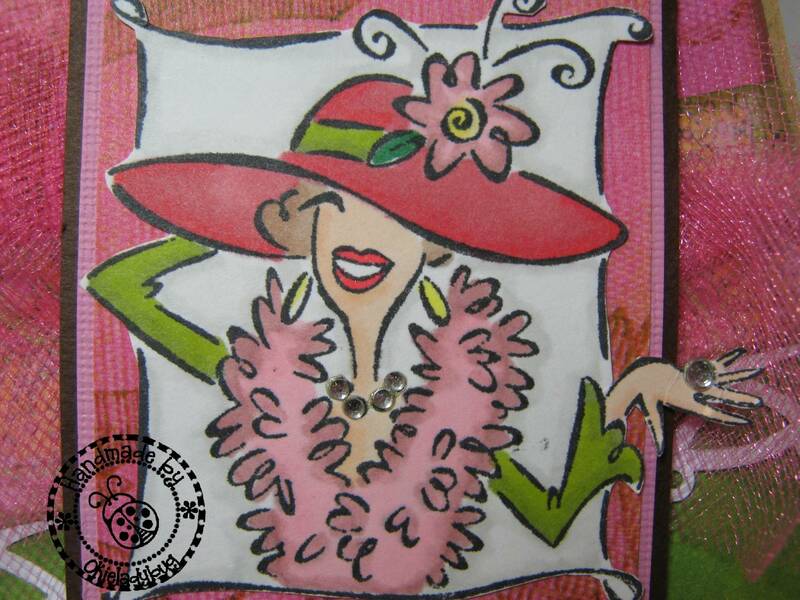 Fabulous card and bag. I always love your projects. Okie!! I would LOVE LOVE LOVE to win markers!! OH and you know your stuff is always fab! in my eyes. It's funny how that hat matched exactly with the stamp... wierd!